To the honor roll of pianists who have engraved their names on instruments, such as Muzio Clementi and Ignaz Pleyel in the 19th century and Daniel Barenboim and Paolo Fazioli in the 21st, we must now append Hungarian pianist Gergely Bogányi, an internationally famous Chopin specialist who won the Kossuth Prize and other honors. Clementi and Pleyel created manufactories in an era when piano technology was rapidly advancing, Fazioli has recently perfected the standard model in an era of stasis, and Barenboim just last year looked to the past with his straight-strung model made by Chris Maene with support from Steinway & Sons; Bogányi, by contrast, has imagined and designed a futuristic apparition. At last week’s debut for the press and selected guests at the Elms, Newport Music Festival director Mark Malkovich IV invited Bogányi to describe the powerful emotions that led him on a quest for an instrument that could convey the music in his soul. And he shared his own pride in the consummation of the two years of planning that resulted in the special presentation with two concerts. Taking the stage, Bogányi related how some years ago he took the prototype to successful industrialist and former cabinetmaker Francois Bandura, director of the Mono Group. Along the way, Hungary subsidized the project and somehow it caught fire. At the conclusion of the pianist’s inspiring speech, one of the several resulting instruments was unveiled. 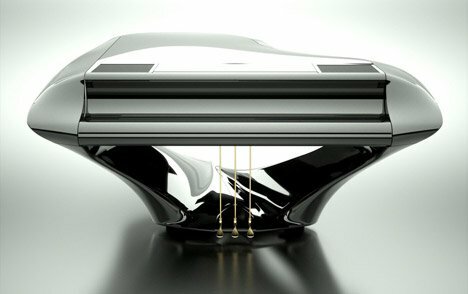 Imagine a powerful wind sculpting glistening-black volcanic sand, then spray it with high-gloss resin before the tide comes in, and you may get some idea of the Flügel (German for grand piano, blade, and wing) that others have compared to batwings or platform pumps. Before we got to audition this vision, we heard something from the elegantly understated and bespoke-suited Bandura about the prestige manufacturing process which took place at his 1000-person enterprise specializing in luxury-car dashboards and trim. He explained how 3D scanning of the prototype allowed the company’s robotic processes to create the complex curves of the enclosing casework. He designed the patterns for the cast-iron frame and set up automated machining for the unique bronze agraffes which connect the strings to the bridges. He developed the weather-impervious soundboard through the firm’s existing expertise in impregnating resins into carbon fiber cloth. Now, this material is nothing new for musical instruments. Boston’s own Luis Leguia (retired BSO cellist) has for several years made well-respected violins, violas, and cellos out of the woven black fiber. They sound powerful and bright, and the BSO has not yet permitted them in the string choirs. Other aspects of the Bogányi piano are more conventional. 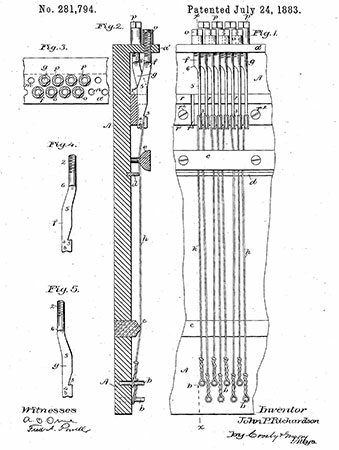 The action, consisting of keys and hammers, is a product of Renner, the company that equips German Steinways. Underneath the curvaceous skin is a massive frame of Douglas fir which is little different from any well-built piano of the past 100 years. Nor does the tuning system of metal pins in a wooden block constitute any sort of departure from current practice. 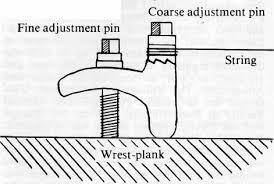 Perhaps in Bogányi 2.0 there should be consideration of the Mason & Hamlin screwstringer system or the Pleyel rocker and ratchet mechanism, both methods very successful except for manufacturing costs, which today CAM would solve. From the advent of clockworks, music boxes with prongs and barrel organs of various complexities, including such notables as the Salzburger Bull, satisfied the need for musical automata. It was not until the mechanisms by Ampico, Welte-Mignon and Duo-Art that automatic devices began to reproduce the nuances of individual pianists. To have a virtual Josef Lhévinne in one’s parlor playing his signature encore, the Shulz-Evler Arabesque on Strauss’s “Der schönen blauen Donau,” could be uncanny. That so much could be done with pneumatic coding from a punched paper roll must have inspired the cardreaders in early computers. Duo-Art was proud of its 16 levels of volume, but that was not enough for Godowsky who facetiously claimed to require 18. The Disklavier Pro of today has 1023 and records the motions of the hammers, and pedals with high resolution—not just the keys. Wayne Stahnke developed the first successful system to use electromagnetic solenoids in conjunction with motion sensors under the control of a computer to accurately record and reproduce fully nuanced piano playing. The Disklavier system and the Steinway Spirio are heirs to that research. On one occasion I attended a recording session before which Tonmeister Gunther Schuller told us to feel free to cough and squeak chairs. The Bösendorfer SE player mechanism was to record the motions of Frederick Moyer’s fingers, and only after we had all left, and mistakes were patched, would the piano play itself for the microphones. Bogányi has yet to record himself this way, but when he does, his piano has automation and speakers that can add other instruments; in our $10 million penthouse or $100 million yacht we will be able to have a virtual orchestra on hand as Bogányi plays a concerto. Or if we are fancying a jazz club, the piano/speaker combination can come up with something duskier. Indeed, for much of the reception we got much of the latter. After two hours of testimonials and hors d’oeuvre, we finally got to hear how this beautiful beast sounded. Poised like Mercury on a winged chair, Bogányi commenced a Chopin Ballade in a relaxed yet probing manner. The sound could get large indeed, carrying a distinctive, bright, and quite pointed clarity. I would have to listen longer in a room without noisy air conditioning before opining more fully, but my initial take is that we may be missing some of the complex ringing overtones and string interactions that the best spruce soundboards afford. Consistent from piano to piano these instruments are likely to be, and stable in tuning, although anyone who can write a check for $300,000 can afford visits from a technician. Nevertheless, I am most intrigued. And according to the publicist, six deals were consummated at this gig. A $1.8M take does not constitute a bad night for anyone’s music biz. Love the look. The model number should be NCC1701-88. 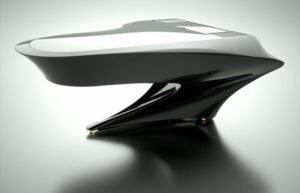 Just the thing for the cocktail lounge on Elon Musk’s space ships. I love the look, too, although I suspect the head-on view benefits from the keyboard being closed. And the streamlined unity is not disrupted by a bench. How ’bout a photo of it as a functional object, ope, with bench? Happy to comply with an additional image. Dunno why, but it also makes me think of LavaLamps. An interesting technical feat. If it doesn’t sound better than a conventional piano, then I don’t see the point. Sorry, but I think it is ugly. It’s never clear what ‘sounds better’ might exactly entail, but search ‘boganyi piano’ at youtube and you can get a good sense from a half-dozen and more videos. It is hard to tell from some that feature excess overtalk, but the instrument sure does sound distinctive and to my ear promising. @Vance Koven – actually it should be the NCC1701-90. The Bogányi has two extra keys at the bass end!